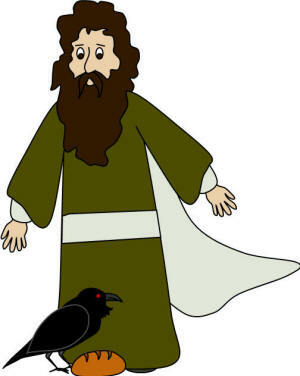 This story is about a prophet named Elijah. Elijah was a regular man who made mistakes, who was afraid sometimes, yet when it really mattered he trusted God. Elijah did amazing things with God's help and God did amazing things for Elijah. A few things you should know before we start the story is that the land of Israel where Elijah was going was very evil. There was a king named Ahab who believed in a god named Baal (the weather god). He and most of the people worshipped this god and did many things that the Bible says we shouldn't do. King Ahab also had a wife named Jezebel. The king and his wife both came from very evil families. Together they helped make Israel a place that God did not like. That's why God sent Elijah, he would show the people that God was more powerful and the one they should be worshipping instead. It all started when Elijah was told by God to deliver a message to King Ahab. Elijah went to Ahab and told him, "My God has told me that there will be no rain or even dew in the next three years until I tell it to." I'm going to guess that Ahab didn't believe this would happen because he worshipped Baal who was the lord of the weather and he should've been able to give rain whenever the people prayed for it. Now just think for a second if you had no rain, snow, or even dew for three years. Rivers and lakes would get very small or dry up completely. Since that's where we get our water from we probably wouldn't be able to have baths or flush toilets anymore. Getting a drink of water wouldn't be as easy anymore, we might only be allowed to have one cup of water a day. After Elijah told King Ahab what would happen the Lord told Elijah to go and hide. And while there would be no rain and not much food in the land, God made sure Elijah had what he needed. He stayed by a brook where there was water for him to drink and a type of bird called the raven, brought him bread and meat for breakfast and supper everyday. Neat, huh?! After some time passed, the brook that Elijah was drinking from dried up and there was no more water to drink. So God told Elijah to go to a place called Zarephath, there he would find a lady who would give him food and water to drink. So Elijah trusted God and did just what he said. When Elijah got to the entrance of the town he saw a woman there gathering wood. He asked her, "Would you please bring me a little water in a cup so I can drink and a small piece of bread?" She replied, "I believe in God as you do, but I don't have any bread to eat, just a small amount of flour in a jar and a little oil in a jug. I was just going to go home and make the rest of the food for me and my son and then we will probably die because we will have no food left." Elijah said to her, "Don't be afraid! Go home and make the food for you and your son, but first make a small loaf of bread for me, and bring it to me. The Lord has told me that if you do this your jar of flour will never go empty and the jug of oil will not go dry until the day the Lord gives rain on the land." So, she went home and did as Elijah had told her and everyday there was food for Elijah, the woman and her son. Imagine trying to empty a glass of water and it never goes empty. This was another of God's amazing miracles. Everything was going fine until the woman's son got sick and died. She went to Elijah for help, she thought God was punishing her for all the mistakes she had made. So Elijah rushed over to her house and said, "Give me your son." He took the boy in his arms to the room upstairs where he was staying. Then he cried out to the Lord, "O Lord my God, please let this boy live again!" Elijah spread his hands over the boy and cried out to God like this three times. The Lord heard his cry and the boy began to breath. Elijah picked up the boy and took him back downstairs to his mother and said, "Look, God answered my prayer, your son is alive!" As the woman hugged and kissed her son she said to Elijah, "Thank-you! I know that the Lord is with you and whatever you say is true." Now, if you think that is a cool story, that's only the first half! God has much more in store for Elijah. Elijah still has to show the people of Israel, King Ahab and Jezebel that Baal isn't God. Elijah doesn't know how he's going to do this, but God has it all planned out. Over three years had gone by without a drop of water from the sky. Animals were starting to die because they had no water or food. Also during this time the evil Jezebel was trying to get rid of all the prophets of God like Elijah (a prophet is like a mailman, they send messages from God so we can know what he wants us to do). What Jezebel didn't know was that one of the king's servants named Obadiah, who was in charge of the palace, was hiding the Lord's prophets in caves to keep them safe. God spoke to Elijah and told him, "Go to Ahab and I will send rain." So Elijah went to find Ahab. When Ahab was told that Elijah wanted to see him he said in an an angry voice, "Is that you Elijah, the troublemaker of Israel?" Elijah quickly replied, "I am not the troublemaker. First your father and now you have disobeyed God over and over again. You stopped following his commandments and have followed Baal. Now send for all the people of Israel to meet me on Mount Carmel. Bring all the prophets of Baal and the false prophets of Jezebel." None of us should disobey God, but God was especially mad because Ahab and his father were both kings. Kings had a lot of responsibility like presidents and prime ministers. They made laws and people listened to them, and when the King and Jezebel ruled Israel they didn't worship God they worshipped Baal, and unfortunately a lot of the people turned to Baal like they did. All the people gathered on Mount Carmel. Elijah stood before the people and said, "How long will you keep changing your mind? If the Lord is God, follow him; but if Baal is God, follow him." The people just stood there and said nothing. Then Elijah said to them, "This is what we're going to do. I am the only prophet of the Lord left and Baal has over four hundred. Get two bulls, let them choose the one they want and I will take the other one. Cut it up and place it on wood, but do not start the wood on fire. I will do the same. Then you call out to Baal and I will call out to the Lord. The god who listens and starts the fire is the real God." All the people nodded and agreed. So Elijah said to the prophets of Baal, "Get a head start and get your bull ready first. Call on Baal, but do not start the fire yourself." So they picked the best bull and set it on the wood. Then they began calling on Baal to start the fire. They shouted and danced around the altar yelling to Baal to start the fire. They shouted and shouted from morning till noon with no answer. Around noon Elijah was getting bored but he said to the prophets of Baal, "Maybe you're not shouting loud enough. Maybe your god is busy or sleeping and he can't hear you, you better shout louder." So some of the people ran around screaming to Baal, others were bowing and crying to Baal. They just couldn't seem to do enough, but nothing happened. The people who believed in Baal had done this all day long and they were very tired. Finally, Elijah called the people over to his altar. He began to make his altar. He took some stones and put them around his altar. Then he built a trench around his altar to hold about a bath tub full of water. Then Elijah did something very strange. He asked the people to pour water over his bull, the wood and enough water to fill the trenches below the altar. How was God going to start a fire when the whole altar was soaking wet? The people started to giggle and thought for sure that Elijah's God would never be able to start a fire now. After the entire altar was completely soaked Elijah stepped forward and simply prayed: "O Lord, God of Abraham, Isaac and Israel, show us today that you are the real God of Israel and that all I have done is obeyed you. Answer me Lord, so that these people can believe in you once again." Just as Elijah finished his prayer and everyone stood silently watching, fire burst out of the altar and everything was covered in flames. Every single thing was burnt down to nothing, and all the water was gone. As the people watched completely amazed they began to fall on their knees and cry out, "The Lord, he is God! The Lord, he is the real God!" Then all the prophets of Baal were taken away and Elijah told Ahab to watch because now that the people didn't worship Baal anymore, the Lord would let it rain. Then Elijah went back to Mount Carmel and prayed to God that the curse would be over and that rain would come. While he was praying he asked his servant to go look towards the sea for a rain cloud. The servant came back and said, "There is nothing in the sky Elijah." Elijah asked him seven times to keep looking, and the seventh time the servant came back and said, "This time when I went to look there was a very small cloud, as small as a man's fist coming this way." Elijah said to the servant, "Run to Ahab and tell him if he wants to get to his palace in Jezreel he'll have to leave now, the rain is coming." Meanwhile, the little cloud grew bigger and bigger and the sky got darker and darker. The wind started to blow and it began to pour and pour and pour... and the drought was over.